If you use Apple’s finger gesture feature to zoom, scroll, swipe and pinch to provoke actions in various applications on your Mac, you should definitely try out the still free(!) and seriously powerful, application, BetterTouchTool. 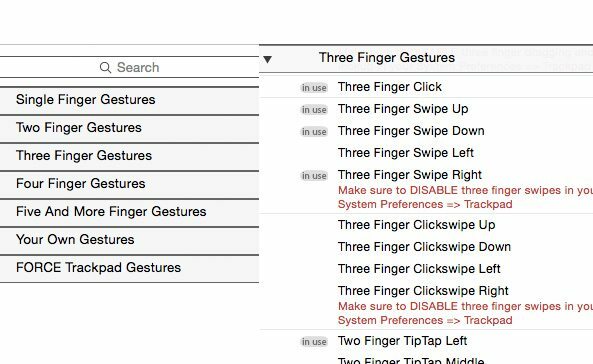 Apple’s finger gesture features (found in System Preferences), consist of a few dozens gestures, such as for control-clicking a file or selected text, zooming in or out of and rotating a photo in Preview or Photos, and swiping to show Notification Center, Mission Control, the Desktop or Launchpad. These gestures are great, especially if you don’t like using keyboard shortcuts. 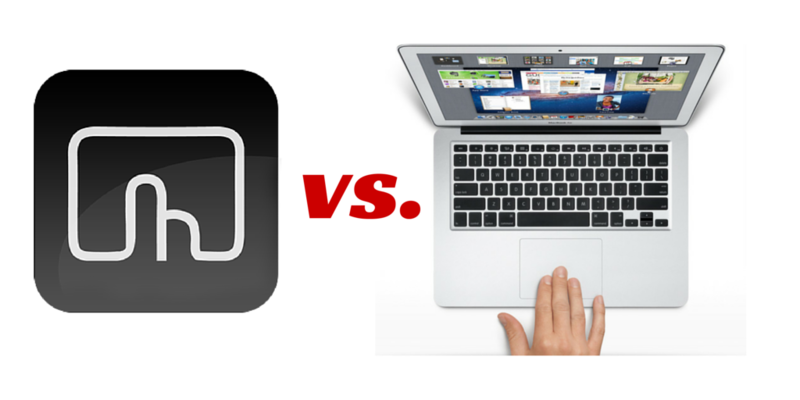 But BetterTouchTool does a whole lot more. Whereas Apple’s finger gestures are limited to a few one, two and three-finger gestures, BTT comes with hundreds of finger gesture combinations, including single, two, three, four, and five-finger gestures. And while Apple’s features include tapping and swiping, BTT includes swipe up, swipe down, swipe left and right, tap and double-tap, click-swipe left and right, and numerous TipTap gestures. BTT’s user interface is not as elegant and user-friendly as Apple’s finger gesture setup, but once you learn to use BTT, you can do tons more. Granted, BTT doesn’t have the beautiful user interface design that Apple’s feature has, but after you get used the geeky design of BTT, you will get tons more options for navigating nearly every part of your Mac using your trackpad or MagicMouse. 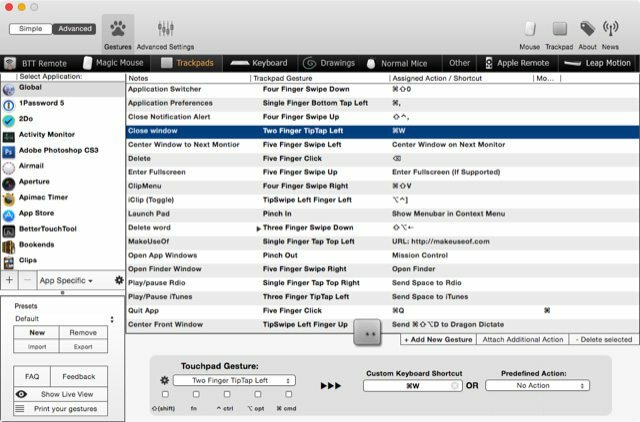 So for on Mac Automation Tips, I have published a half-dozen articles about using BetterTouchTool. I will keep sharing as many tips as I can about the application, so that you can take full advantage of the program, and use it to become productive on your Mac. Get comfortable using a few gestures at a time, and then add more as your needs expand. Use the same gestures in different applications. For example, I use three-finger tap to open the sharpen and color tool in Preview, but in Rdio, the three-finger tap is used to pause and play music. Use a gesture that might fit the action. For example, I use the three-finger click on the Desktop to delete files. The click, rather than a swipe, reminds me of deleting something. Change or delete gestures that you’re not using. Review your gestures when you haven’t been using an applications for a while. You might leave the BTT interface open for a while as a reminder of the gestures assigned to a particular application. 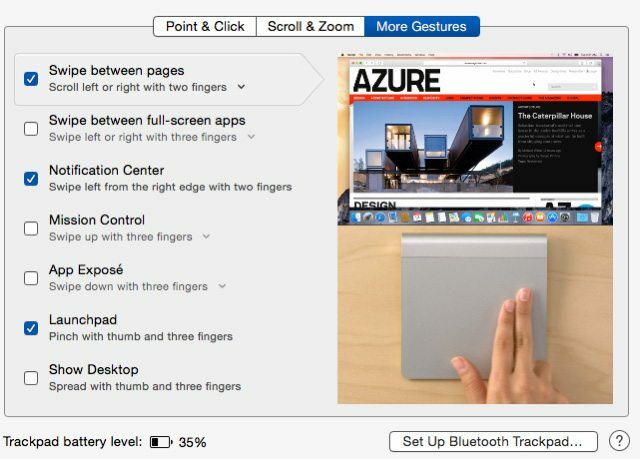 BTT also works with normal mice, Apple Remote, Leap Motion, and the BTT Remote app for the iPhone. 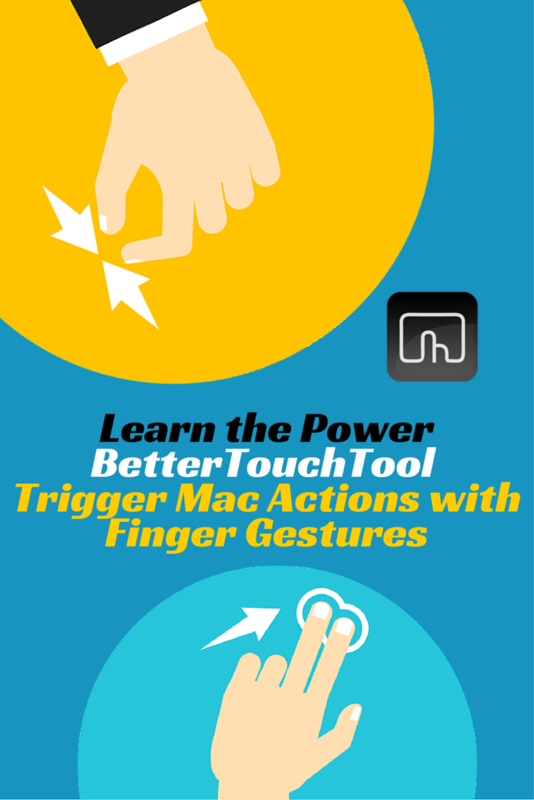 BetterTouchTool is fairly easy to learn, but I have created an entire course that teaches you how to get up and going with BTT, and how to use all its main features. 13 video tutorials with step by step instructions for using all the main features in BTT with a trackpad. 11 PDF guides with screenshots and step-by-step instructions. A PDF guide of all the BTT actions I currently use. Best practices for using BTT . Free lifetime updates to all the course content. Let me know if you’re using BTT in your daily Mac workflow. How are you using the application to your advantage? What questions do you have about using the application? What problems, if any, are you experiencing with the application? And please share your tips for getting the most out of the program. I originally used BTT to speed up my cursor movements because the default is ridiculously slow. 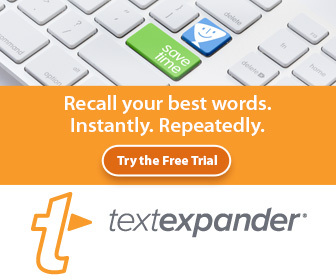 I have used a few app-specific gestures for years but recently added copy and paste. Those two have made a big difference and I should have added them sooner. My most used shortcut brings up the menu for ClipMenu which stores recent copies. Together these decrease my need for hand motion by huge amounts. I also use BetterSnapTool which is equally awesome if you like/miss Window’s snapping function. Thanks for your feedback. We both use BTT for similar reasons. To me, the program should be used by all Mac power users because of the time and keystrokes it can save you from clicking. Thanks for being a reader and subscriber.